For years Ryanair and Michael O’Leary have handled the media with a deft touch. Think of all the free advertising Michael O’Leary has garnered for the company, and how they have dealt with extraordinarily negative opinion of their service offering while growing their business into one of the biggest airlines in Europe. But last week, Ryanair were dealt an incredible blow when they had to immediately cancel around 1,900 flights due to an administrative problem on their part. This is one of the biggest PR challenges they have faced, so we wanted to see how effectively Ryanair handled the news. With our APIs, we can use text analysis to measure the reaction to the announcement, both in the news and on social media. Ryanair announced the news late on Friday, an old PR trick to minimize negative coverage. How effective was this in the news cycle? Does this old-school PR trick have an effect on the social media reaction? Exactly how negative was the press coverage that Ryanair was trying to minimize? How many of the Tweets mentioning Ryanair were affected by the cancellations and how many were just jumping on the bandwagon? 1. Did Ryanair’s Friday evening press dump work? Ryanair first started cancelling flights on Friday morning, but decided not to officially announce the news until later that evening, which is a common PR trick – announce bad news late on a Friday so the press coverage is affected by the weekend lull, hopefully resulting in less coverage. You can see above that announcing the news late on Friday meant that while the conversation about Ryanair took off on Twitter over the weekend, it took the press until Monday to catch up. It’s important to note here that on Monday there was no new news to be released except a detailed list of the flights affected – the press coverage on Monday was essentially working off old news. So by the comparatively small amount of stories over the weekend we can see that Ryanair successfully got out ahead of the story and minimized the immediate impact. But if people are talking about the cancellations online, what does it matter if there were fewer stories in the press? The previous chart shows that although there was a huge amount of chatter about the Ryanair cancellations on social media, at the same time there were fewer news stories being written. The obvious implication here is that there were fewer stories for social media users to share – more journalists off for the weekend meant fewer stories were appearing in people’s news feeds. So to put this idea to the test, we used the Trends endpoint of the News API to gather the 10 most-shared stories about Ryanair on Facebook on Friday, Saturday, and Sunday, and counted how many times they were shared. Take a look at how many more shares the rest of the stories got on Monday than on Saturday, even though the news was three days old at that point! With this information, we think it’s a good bet that stories about Ryanair got much more shares on Monday because more people had stories in their news feeds. To be exact, Monday’s top 10 most-shared stories were shared over 43,000 times more than Saturday’s 10 most-shared stories, simply because news publishers were back in full swing (remember – there was no new important information). This implies that however bad the coverage was on Monday (and it was bad, as we’ll see) the old PR trick of dumping stories on a Friday evening also has an effect on the spread of news on social media. It’s difficult to quantify the combined reach of these extra 43,000 shares, but that’s a lot of extra negative publicity that Ryanair avoided! We thought this was interesting – although social media is a huge disruptor of the publishing industry, the fact that the old Friday evening press dump works on Facebook sharing tells us that traditional journalism still guides what people are talking about on social media. 3: How negative was the press coverage that Ryanair was trying to minimize? So far we’ve assumed that the stories about Ryanair were largely negative, but we haven’t looked into how negative they were. Using the Trends endpoint of the News API, we can do just that, and we found that 85% of stories about Ryanair had a negative tone last week. Take a look at how the sentiment changed over each day last week. You can see it gets extremely negative from Friday onwards. 4: Did people ‘swarm’ the bad news on Twitter? We pointed out that there was a massive spike in mentions of Ryanair on Twitter on Saturday, before the media could cover the story as extensively as they would on a weekday. This gave us an interesting opportunity – sometimes PR research can be hampered by swarming, which is when people unaffected by a problem jump on the bandwagon and add to the negative press. So we came up with an idea to separate affected customers from people swarming in this example. To identify those actually affected by the events and those who were jumping on the band wagon we narrowed our search to Twitter users who mentioned flight details like locations of departure or arrival and those who didn’t. We made the distinction that those who hadn’t mentioned any specific details about their flight were more than likely swarmers while those who gave specifics were actually affected by the cancellations. Take a look at these two Tweets as an example, one is a customer affected by cancellations and another is just someone who wanted to say something negative about Ryanair after the news broke. Massive props to @Ryanair for now stranding us in Bari after making me catch pneumonia at Stansted, outdone yourself this time guys!! So that’s our AI-powered layman’s analysis of the coverage of the Ryanair cancellations PR disaster. We think that although the press is extremely negative, Ryanair did a pretty good job of mitigating the volume of it. 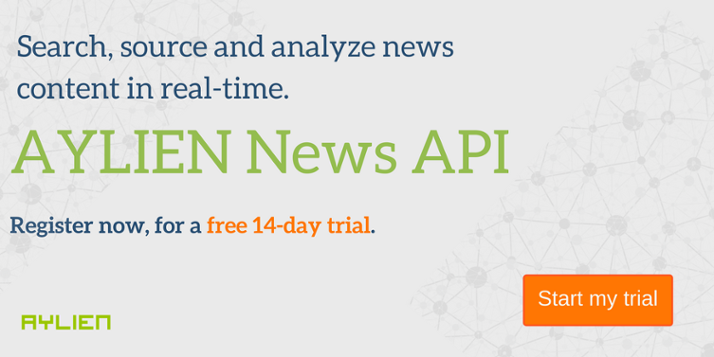 If you want to try out our APIs, take a look at the demos of our APIs or sign up for a trial – the News API has a two-week free trial and the Text API lets you analyze 1,000 pieces of text per day free of charge so you can get set up using the API.